Kenneth Brian "Babyface" Edmonds (born April 10, 1958) is an American R&B singer-songwriter, guitarist, keyboardist, record producer, film producer, and entrepreneur. Kenneth Edmonds was born on April 10, 1958, in Indianapolis, Indiana to Marvin and Barbara Edmonds. Barbara was a pharmaceutical plant manager. Edmonds, who is the fifth of six brothers (which also included future After 7 bandmembers Melvin and Kevon Edmonds, the latter of whom later had a modestly successful solo career), attended North Central High School in Indianapolis, Indiana and as a shy youth, wrote songs to express his emotions. When he was in eighth grade, Edmonds's father died of lung cancer, leaving his mother to raise her sons alone. At this stage, Edmonds became determined to have a career in music. Edmonds later played with funk performer Bootsy Collins, who tagged him "Babyface" because of his cute face while he was still a teen. He also played in the groups Manchild (which had a 1976 hit "Especially for You" with band member Daryl Simmons), as he was a guitarist for the band. Then, as a keyboardist in the light-funk and R&B group The Deele (which also included drummer Antonio "L.A." Reid, with whom he would later form a successful writing and producing partnership). One of his first major credits as a songwriter for outside artists came when he wrote the tune "Slow-Jam" for the R&B band Midnight Star in 1983. The tune was on Midnight Star's double-platinum No Parking on the Dance Floor album, and while it never hit the charts, the song is still played on quiet storm shows. Babyface remained in The Deele until 1988, when both he and Reid left the group. In the late 1980s, he contributed to the creation of new jack swing, writing and producing music for the likes of Bobby Brown, Karyn White, Pebbles, Paula Abdul and '80s icon Sheena Easton. In 1989, Edmonds co-founded LaFace Records with Reid. Three of the label's early artists TLC , Usher, and Toni Braxton were successful, the former becoming one of the best selling female groups in music history. Braxton's eponymous 1993 debut album went on to sell over eight million copies, and earned her the 1994 Grammy Award Best New Artist. TLC's first two albums on LaFace--1992's Ooooooohhh... On the TLC Tip and 1994's CrazySexyCool--combined to sell more than 15 million copies in the U.S. CrazySexyCool won the 1996 Grammy Award for Best R&B album. Babyface helped form the popular late-90s R&B group Az Yet. Edmonds works with many successful performers in contemporary music. "I'm Your Baby Tonight," produced for Whitney Houston, was his first #1 Top 40 hit in the US. He also wrote and produced Boyz II Men's "End of the Road" and "I'll Make Love to You," both of which established records for the longest stay at #1 on the Billboard Hot 100 chart. He co-wrote, co-produced, and provided backing vocals on Madonna's 1995 Bedtime Stories, which featured the 7-week #1 hit "Take a Bow," and shared billing with Eric Clapton on the chart-topping Grammy winner "Change the World" from the Phenomenon soundtrack. He also wrote and produced the #1 hit "Exhale (Shoop Shoop)" for Whitney Houston as well as the rest of the critically acclaimed 10 million selling Waiting to Exhale soundtrack in 1995, which spawned additional hits for Whitney Houston, Brandy and Mary J. Blige. Additionally, Edmonds has produced and written music for many artists including Carole King, Patti LaBelle, Chaka Khan, Aretha Franklin, Madonna, Janet Jackson, Al Green, Beyoncé, Diana Ross, Sheena Easton, Toni Braxton, Michael Jackson, Michael Bolton, Paula Abdul, Pebbles, Tevin Campbell, Bobby Brown, Whitney Houston, Brandy, Mary J. Blige, Tamia, Shola Ama, 3T, Sisqó, Dru Hill, Fall Out Boy, Céline Dion, Katharine McPhee, Mariah Carey, Vanessa L. Williams, Chanté Moore, En Vogue, Eric Clapton, Kenny G, Kristinia DeBarge, Lil Wayne, Japanese singer Ken Hirai, P!nk, Marc Nelson, TLC, and Phil Collins among others. He received three consecutive Grammy Awards for Producer of the Year in 1995-1997. In 1994, he appeared and performed on an episode Beverly Hills, 90210 titled Mr. Walsh Goes to Washington (Part 2). In the mid-1990s, Edmonds and his then wife Tracey Edmonds expanded into the business of motion pictures, setting up Edmonds Entertainment Group and producing films such as Soul Food (1997), Josie and the Pussycats (2001), and also the soundtrack for the film The Prince of Egypt, which included contributions from numerous artists, including Mariah Carey and Whitney Houston. They are the current executive producers of the hit BET reality series College Hill. Edmonds also worked with David Foster to compose "The Power of the Dream," the official song of the 1996 Summer Olympics, performed by superstar Céline Dion. Linda Thompson provided the lyrics. Babyface also participated as a duet partner on the Fox reality show Celebrity Duets. Babyface was in the studio for about two years with Ashanti to produce her album The Declaration. His album Playlist consists of eight cover songs and two original works. It was released on September 18, 2007. It was the first album on the newly re-launched Mercury Records label. He worked on the Lil Wayne album Tha Carter III, on the Kanye West-produced "Comfortable." He also worked with R&B singer Monica for her upcoming album Still Standing. He has written and produced over 26 #1 R&B hits throughout his career. 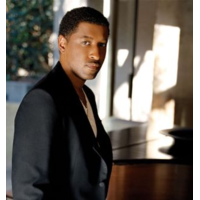 On August 30, 2006, Babyface was honored as a BMI Icon at the 6th annual BMI Urban Awards. Throughout his career, Babyface has won the BMI Pop Songwriter of the Year trophy seven times and a total of 51 BMI Awards, which includes Song of the Year for his Toni Braxton hit, "Breathe Again," in 1994. In October 2005, Edmonds and his wife, Tracey Edmonds, announced that they were ending their marriage of thirteen years. They have two sons, Brandon and Dylan Michael. Edmonds began dating his backup dancer Nicole "Nikki" Pantenburg (former dancer and personal friend of Janet Jackson's) in 2007. In September 2008, Edmonds and Nicole welcomed a daughter, Peyton Nicole Edmonds. In 1999, a 25-mile (40-km) stretch of Interstate 65 that runs through Indianapolis was renamed Kenneth "Babyface" Edmonds Highway.